Fire’s nature is to purify. It carries our prayers & acts as a messenger, between man & God. 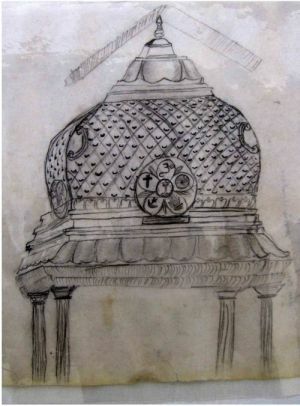 In December 2009,a picture of a temple dome was found in one of Amma’s books. In her meditation, Amma asked Swami about this picture. Swami told, "I have drawn the dome of a temple Garbha Griha. It is supported by four pillars. These represent the four legs of dharma. The petals above the pillars indicate the thousand petaled sahasrara. The symbol in the middle shows the unity of all religions. All religions will come under the one umbrella of God. All will become embodiments of Love. People will live as children of God". Swami told that a new building should be constructed with a dome like this in Mukthi Nilayam. 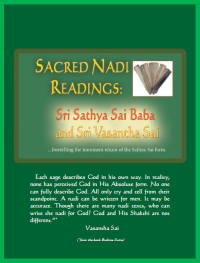 For further details, Swami asked Amma to refer a particular nadi reading. As per Swami’s command, the Kakabhujandar Nadi was referred, and to the amazement of all, every minute detail about the construction of the temple and its significance was found. The Nadi referred to this new building as “Viswa Brahma Garbha Kottam”. Also it is called as the “Temple of Vedas”. The temple has been built within 10 months. The Bhoomi pooja (laying the foundation stone) for the temple was performed on January 25, 2010. Consequently, the Kumbhabhisekam (temple consecration) was performed on October 21, 2010. The Paduka Prathistha ceremony (installation of the Holy Sandals of Bhagawan Sri Sathya Sai Baba) was performed. By building this temple, all will attain birthless state, Jeevan Mukthi. God will protect and guard. Amma will ripen and mature in wisdom and attain the supreme state. The Garbha Kottam is also the Music Sabha, Veda Sabha, Jnana Sabha. The nine planets, Lord Ganapathy, Trimurthis – Lord Brahma, Lord Vishnu and Lord Shiva with their respective consorts, 18 Siddha (perfected souls) with their respective consorts, Sage Kakabhujandar who is giving the Nadi and His wife Bahula Devi, 330 crores of Devas, 63 Nayanmars will reside here, because this is the abode of the Primal Soul. The Light of Sun of Wisdom, which comes through the top of the Garbha Kottam, will enter and pass into Amma’s third eye. Amma will merge in the Supreme Self and will become Poornam, Supreme Absolute (Samadhi State). On the day of Kumbabhisekham, She will enter the temple in Green Silk and Chandan alankar (adorned with Sandal paste). She will sit on the Sacred Peetam and shower Her Grace as Iccha Shakti, Narayani, the pure hearted one.